MTN Nigeria would probably have got away with a much smaller fine for its reluctance to deactivate improperly registered SIM cards, had a high-profile kidnapping not happened in Nigeria. The incident occurred on September 21, in Akure, a sleepy town 300 kilometres northeast of Lagos, which is Nigeria’s commercial hub, and home to MTN’s Nigerian operations. The target: Olu Falae, a former Nigerian Minister of Finance, and runner-up candidate in the 1999 presidential elections. Falae, who turned 77 on that day, was abducted from his farm, on the outskirts of the town, which is also the capital of Nigeria’s Ondo State. Eyewitness accounts from farm workers alleged that nomadic herdsmen had carried out the abduction. (The herdsmen, ethnic Fulanis from northern Nigeria, are to be found across large swathes of the savannah belt between the country’s arid north and the densely forested south. In recent years dwindling grazing territories have pushed them southwards, and triggered violent clashes with locals, who complain that the Fulanis’ cattle are destroying farmlands). 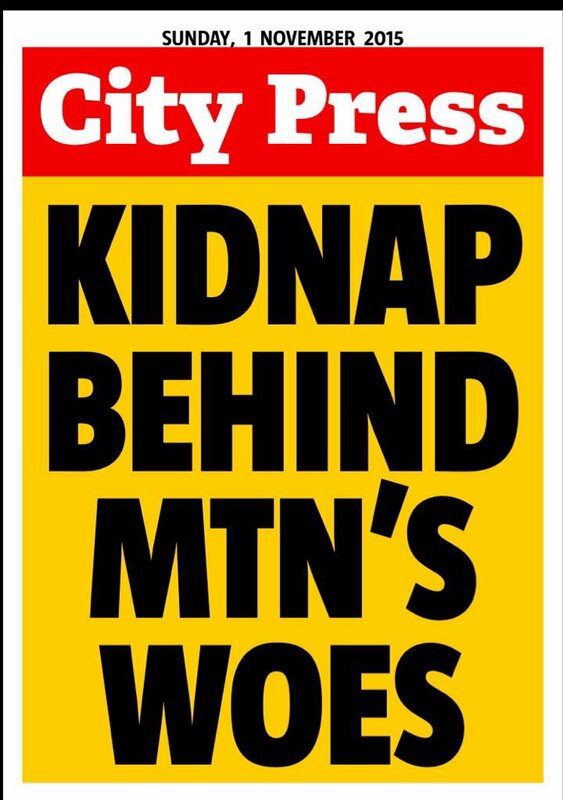 Newspapers reported that the kidnappers were asking for a 100 million naira ransom, and that negotiations were ongoing. And then three days later, on September 24, Falae was freed in Owo, fifty kilometres from Akure, amid confusion as to whether a ransom had indeed been paid or not. The police denied knowledge of a payment; Falae insisted his family paid a ransom. It was one of the most high-profile kidnappings in Nigeria’s history; given explosive resonance by its ethnic and religious dimensions – a Christian Yoruba statesman from southwestern Nigeria abducted and harassed by alleged Muslim Fulani herdsmen from the north, in a country where people take pride in defining themselves along fault-lines of region and religion. It is that incident that is now believed to be at the heart of the ongoing regulatory clampdown on a company that is one of Nigeria’s biggest tax payers. The NCC says that the phone lines with which the kidnappers carried out the ransom negotiations belonged to MTN. “[Falae’s] kidnappers used MTN SIM cards and MTN was unable to provide any registration data for those SIMs,” the Commission said in a report it submitted to the Presidency and security agencies. Even before the Falae kidnapping happened, the Office of the National Security Adviser (ONSA), and the Department of State Security (DSS) had weighed into the SIM card registration, citing concerns the absence of registration data on SIM cards was being exploited by criminals: ranging from kidnappers and fraudsters, to Boko Haram terrorists. On September 4, another meeting took place, this time in the President’s office, chaired by his Chief of Staff. It was attended by the security services, including the Directorate of Military Intelligence (DMI), as well as executives from the telecoms companies. According to the NCC, the executives were again warned about the security implications of improperly registered cards, as well as the resolve of the government to penalise defaulting operators. Sentiment is widespread in Nigeria that the telcos have tended to get away with disreputable conduct, preferring to call the regulator’s bluff, and then paying slap-on-the-wrist fines, instead of immediately complying. It is being speculated that MTN chose to not disconnect the lines because it believed the resulting fines would pale next to the forgone revenues from the more than 5 million lines due for disconnection. Indeed, all four of Nigeria’s major phone companies have previously been fined on more than one occasion for their failure to deactivate unregistered lines. The most recent fine came at the end of August, after an NCC enforcement team came out of a compliance check dissatisfied. The NCC slammed a total of 120 million naira in fines on the four biggest operators. MTN, with twice as many subscribers as Globacom, Nigeria’s second biggest operator, took the largest hit, with a fine of 102 million naira. Globacom, Etisalat and Airtel were fined 7.4 million naira, 7 million naira and 3.8 million naira respectively. The penalties were based on a sum of 200,000 naira per defaulting SIM card, as outlined in a Telephone Subscribers Registration Regulations document issued by the regulator in 2011, when it launched the nationwide SIM registration. (Until then there were no obligations for mobile operators to obtain customer personal and biometric data for their SIM cards. The registration for existing SIM cards took place between March 2011 and January 2012; after that the NCC expected that any new cards would be registered at the time of sale). While the previous fines were based on numbers emerging from random, limited-sample monitoring exercises by the NCC, in wielding the big stick this time it decided to penalise MTN for the total number of improperly registered cards. Hence the unprecedented size of the fine. MTN is by far Nigeria’s largest mobile phone network, with 62 million of Nigeria’s 148 million mobile phone subscribers in September 2015, according to NCC figures. That number is double that of Globacom, its nearest competitor, and more than double MTN’s 29m-subscriber base in South Africa, its home market. Nigeria also accounts for a third of the total revenues generated by the MTN Group across the twenty-four countries it operates in. The company is however not listed on the Nigerian Stock Exchange. The MTN Group holds a 78.83 percent stake in MTN Nigeria through a wholly-owned Mauritius-based holding company known as MTN International (Mauritius) Limited. The rest is divided up among a group of private investors, including Nigerian businesspersons, and South African investment firm, Shanduka Group. Since the company announced, on October 26, that it was being fined, share price has fallen by 19 percent, wiping out about more than two billion dollars in market capitalisation. Ratings agency Standard & Poor’s has since downgraded MTN’s credit rating. MTN executives were scheduled to attend an October 29 meeting at the Nigerian presidential villa in Abuja, involving senior government and security services officials, as well as the NCC. “We assume that the NCC wants to be firm but they might also consider that the amount is huge and MTN would make better use of it, or at least part of it, in spending it in network expansions and upgrades at a time when connectivity is crucial to life and economic improvement in Africa,” says Ovum’s Mbongue. It is also believed that the South African government has waded into the matter, and talks on the matter between Presidents Zuma and Buhari are likely to take place, against the backdrop of speculation regarding how the handling of the issue might affect diplomatic relations that are still on the mend following a string of high-profile face-offs in late 2014.